A sanctuary advisory council is a community-based advisory group consisting of representatives from various user groups, government agencies and the public at large. The role of the council is to provide advice to the sanctuary superintendent on the designation and operation of a national marine sanctuary. All fourteen sites in the sanctuary system have an advisory council. 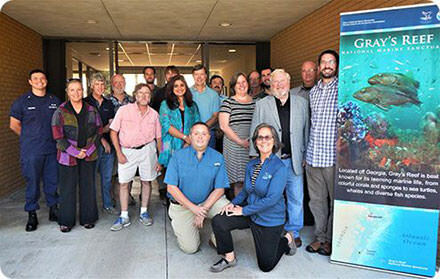 The Gray's Reef Sanctuary Advisory Council was established in September 1999. (L to R): LT Anthony Gallegos, Suzanne VanParreren, Warren Hupman, Peter Auster, Mark Padgett, Colby Harris, Joseph Glenn, Mona Behl, Scott Noakes, Jene Nissen, Mary Conley, Tim Tarver, Bob Crimian, Michael Denmark, Capt. Bob Lynn, Tim Henkel. Front: Elliott Lam, Lisa Wooninck. More information on how the Council conducts its business can be found in the Sanctuary Council Advisory Charter (revised October 2016, Amended June 2017). All of the National Marine Sanctuaries have established Advisory Councils. You can find information about other Sanctuary Advisory Councils at NOAA's National Marine Sanctuaries web site. One of the Advisory Council's most important strengths comes from the diversity of its membership. The Advisory Council consists of nineteen members representing education, research, sport diving, sport fishing, charter / commercial fishing, conservation, law enforcement and selected government agencies. More information on the Advisory Council members can be found on the Sanctuary Advisory Council Members' list. The Advisory Council conducts itself in an open, transparent, and publicly accessible process. This allows for comprehensive and effective participation of all stakeholders. All meetings of the Advisory Council are advertised and open to the public; and meeting documents are available for review. Each member links the sanctuary and the Advisory Council process to extensive networks of constituencies. The Advisory Council thus serves as the sanctuary's link to the broader community of stakeholders and as an entry point for community participation in sanctuary management. The Advisory Council process is helping to vest ownership and responsibility for shaping the future management and protection of the Sanctuary in the community most interested in and dependent upon sanctuary resources. In this way, a sense of community-based sanctuary stewardship is fostered. If you have any questions, feel free to contact the Sanctuary Advisory Council Coordinator by phone at (912)-598-2397 or via e-mail at Chris.Hines@noaa.gov.